Alright, Leif-Errikson-in-training, Viking 101: What do you never leave home without? Three... two... one... TIME! The answer is simple. A conqueror is practically (but not literally, don't get us wrong) naked without his or her trusty, potentially lifesaving shield! That's why if you're invading the coasts of North America hundreds of years before Columbus did, you need our awesome Viking Shield! It's the perfect finishing touch to any Viking getup this Halloween. At over a foot wide, it's just the right size for any warrior, and its foam design makes it easy to carry around. Because conquering is tiring work, trust us. This accessory also strives for realism. 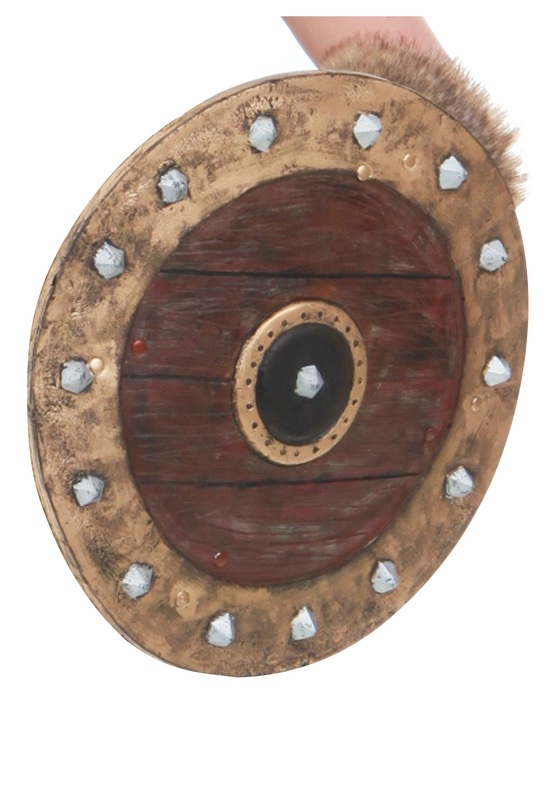 Just like the real thing, you'll carry it with the help of two straps on the back, and the front is painted to look like the shield is made of wood and bronze. So this Halloween, get the horde together and go into battle with your Viking Shield!